Have you tried Scrubbing Bubbles® Multi Surface Bathroom Cleaner? If you haven't...you should! I don't know about you, but having a clean and germ free bathroom is a top priority in my house. It's amazing how quickly my bathrooms become dirty and it seems as if I am constantly cleaning them! Maybe it's the fact that I live with two boys! 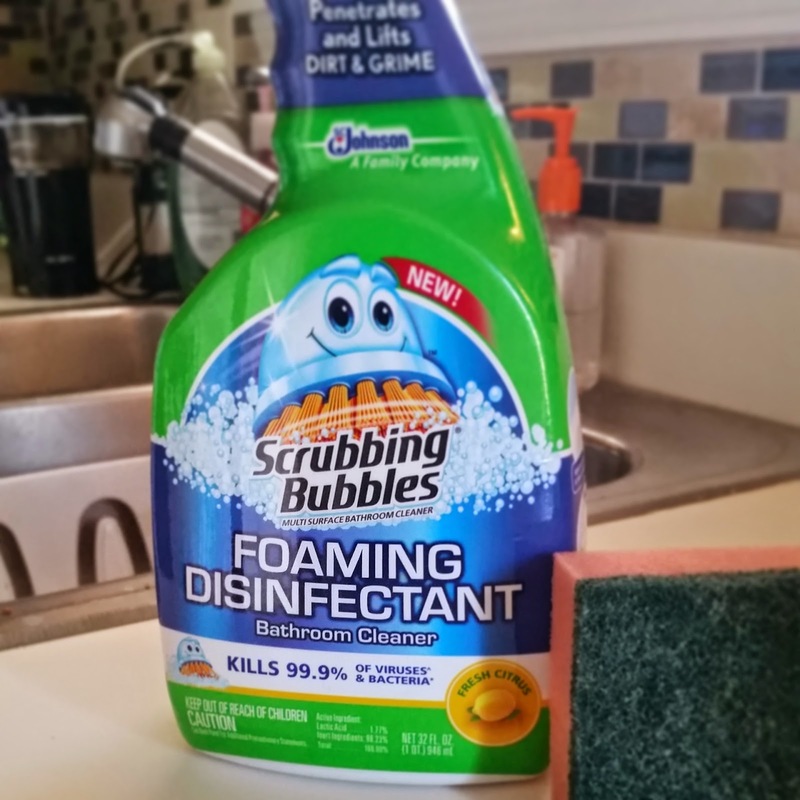 Scrubbing Bubbles Multi Surface Cleaner is 99.9 percent effective in killing germs and it is specially formulated to deep clean to get rid of soap scum, hard water stains, and dirt. Scrubbing Bubbles Multi Surface Cleaner comes in two scents-Fresh and Lemon. I personally love the fresh scent and it actually kills bacteria while deodorizing to make my bathroom smell nice and fresh and of course sparkling! Now, that's a complete clean! Did you know that 1/3 of American said that they make the most messes in the bathroom? Yuck, right? Surprisingly men are more likely to the blame, than women. Most women say it is their spouse and kids that make the majority of the mess. Maybe it's because it's the women that do most of the bathroom cleaning. 57 percent of women are the sole cleaners when it comes to the bathroom compared to just 39 percent of men. Although, on average, Americans spend less than 20 minutes per week cleaning the bathroom. That is why it's so important to have a cleaner like Scrubbing Bubbles Multi Surface Cleaner. It gets the job done quickly and efficiently! Because who really wants to spend a lot of time cleaning their bathroom? I know I certainly don't! Right after I received my bottle of Scrubbing Bubbles Multi Surface I took it upstairs to use on the hardest part of my bathroom to clean... my shower. It seems as if I am always cleaning it! My little boy loves to use bath crayons and paint while in the tub and it always ends up getting stuck in between the tile no matter how hard I clean it. It has gotten to the point where I want to throw the bath paints out. Well, not anymore! I'm happy to report that after a few sprays of the Scrubbing Bubbles Multi Surface cleaner and that pesky paint residue was gone! The tile was sparkling clean! Thank you Scrubbing Bubbles! For more information on Scrubbing Bubbles Complete and where to buy be sure to visit their website at http://www.scrubbingbubbles.com/Pages/default.aspx . You can also find Scrubbing Bubbles on Twitter and Facebook!